Eric Ormsby is the author of five collections of poetry, a book of essays, and a number of scholarly studies of Islamic thought. He was born in Georgia, raised in Florida, and worked for twenty years as director of libraries and professor of Islamic Studies at McGill University. 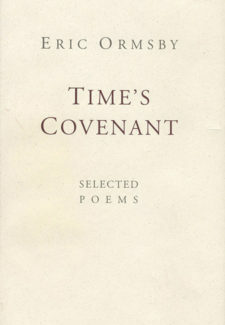 His poetry has been widely published and anthololgized in Canada, the United States, and Britain. In 1992, he received an Ingram Merrill Award for poetry and in the same year was awarded the Qspell Prize for Bavarian Shrine. Since 2004, he has written a weekly column on literature for the New York Sun and regularly contributes essays and reviews to The New Criterion, Books in Canada, The Times Literary Supplement and Parnassus. He has two sons and now lives with his wife Irena, an architectural historian, in London.